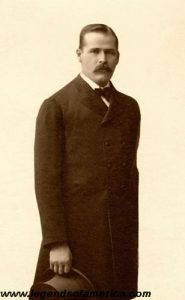 Harry Longabaugh, the Sundance Kid, 1901. Harry Alonzo Longabaugh, better known as the Sundance Kid, was an outlaw and member of Butch Cassidy’s Wild Bunch. During his wild days in the Old West, he also went by the names of Frank Smith, H.A. Brown, Harry A. Place, and Harry Long. 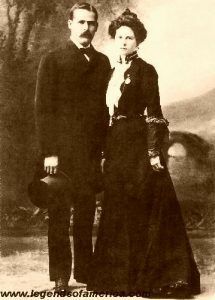 Longabaugh was born in Mont Clare, Pennsylvania in 1867, the youngest of five children of Josiah and Annie G. Place Longabaugh. When he was only 15 years old he headed west with a cousin. By the time he was 20, he stole a gun, a saddle and a horse from a ranch in Sundance, Wyoming, only to be almost immediately captured. He was convicted and spent 18 months in jail, at which time, he took on the nickname of the Sundance Kid. After his release, he worked as a cowboy before being implicated in an 1892 train robbery and by 1897, he had hooked up with Harvey Logan, a member of the Wild Bunch. The two then robbed a bank at Belle Fourche, South Dakota on June 27th. Both men were captured but managed to escape from a Deadwood jail three months later. 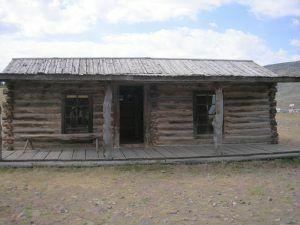 Afterward, they hid out in a log cabin at what is now Old Trail Town in Cody, Wyoming as they planned to rob a bank in Red Lodge, Montana. He soon met up with Butch Cassidy Butch Cassidy, joined the Wild Bunch, and moved to the Robber’s Roost in Utah. On June 2, 1899, the gang, including Butch Cassidy, Sundance Kid, Harvey Logan, and Elzy Lay, robbed a Union Pacific Overland Flyer passenger train near Wilcox, Wyoming. This year is when he is thought to have met up with Etta Place in San Antonio, Texas. On August 29, 1900, Cassidy, Longabaugh, and others robbed Union Pacific train No. 3 near Tipton, Wyoming of about $55,000. Less than a month later, on September 19, 1900, three or four bandits, including the Sundance Kid, struck the First National Bank of Winnemucca, Nevada, stealing $32,640. 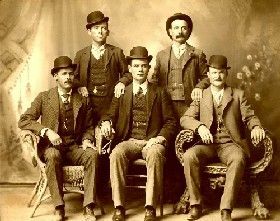 In December 1900, Cassidy posed alongside Longabaugh, Harvey Logan, Will Carver, and Ben Kilpatrick in Fort Worth, Texas for the now-famous “Fort Worth Five” photograph. The Pinkerton Detective Agency obtained a copy of the photograph and began to use it for wanted posters. In the meantime, with the gang breaking up, and feeling continuous pressure from the numerous law enforcement agencies pursuing them, Butch Cassidy, Harry Longabaugh, and Etta Place fled to New York City. On February 20, 1901, the trio departed for Buenos Aires, Argentina aboard the British steamer Herminius. After several years, Etta Place was tired of living life on the run and at her request, Longabaugh accompanied her from Valparaiso, Chile to San Francisco, California in June 1906. The Sundance Kid then returned to South America where he and Butch Cassidy were thought to have been killed in Bolivia in November 1908. However, another tale says the men stayed in South America for some time until they both returned to the United States and Sundance didn’t die until about 1936.